Put the rice in a bowl and wash with cold water. Repeat washing until the water becomes clear. Drain the rice in a colander and set aside. Place the rice in a pot or in a rice cooker. Let the rice soak in the water at least 30 min. One hour is ideal. If you are cooking the rice in a pot, cover the pan with a lid and bring to a boil over high heat. Once the water boils, turn the heat down very low and cook about 15-20 min. until the water is almost gone. Stop the heat and let it steam for 10-15 minutes before opening the lid. Use plastic paddle to make the ready cook sushi rice fluffy. Cool down and stir well with sushi vinegar. Peel and cut avocado (or cucumber or carrot) into stripes. Use plastic paddle to put the rice into the center of the seaweed. Add in sardines, avocado (or cumber) and crabstick, spread some mayonnaise. Roll it. Cut into slice dip with crab roe and put it nicely on plate. Comments: This delicious pastry made with sardines is not only high in protein that promotes safety but also has many nutritional benefits attached to it. Sardine is high in omega-3 fatty acids, help in reducing the triglyceride levels and play a major role in preventing several dangerous heart rhythm abnormalities. Getting omega-3 from sardines is more beneficial than getting it from other large fish, because of the small size of the fish it is less likely to have accumulated toxins, such as mercury, dioxane and PCB. 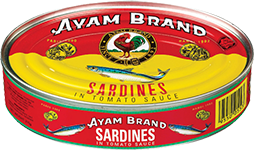 Sardines are an excellent source of vitamin B12 as well, second only to calf’s liver. Vitamin B12 promotes cardiovascular wellbeing, since it keeps the levels of homocysteine in balance, which can otherwise damage artery walls, with elevated levels being a risk factor for atherosclerosis. The calorie from this recipe can be further slashed by replacing part of the sushi rice with brown rice.